Thousands of Doctor Who fans have seen a specially-filmed scene starring David Tennant at a BBC Proms concert dedicated to the sci-fi drama. The concert featured music from the series, as well as classical favourites from composers including Holst and Wagner on the theme of space and time. The panto-style scene, showing Tennant addressing the 6,000-strong audience, was also shown on the show's website. Actress Freema Agyeman hosted Sunday's event at London's Royal Albert Hall. She played Martha - the last-but-one assistant to Tennant's Doctor. 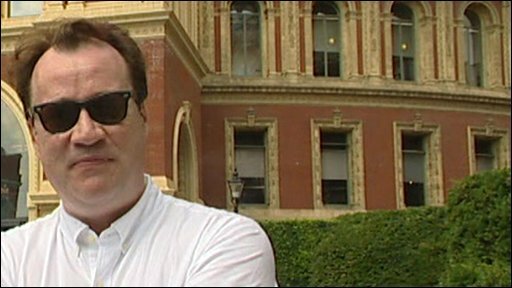 The special scene was written by Russell T Davies, who masterminded Doctor Who's return to TV screens in 2005 and announced recently he would be stepping down as executive producer from 2010. "We've had a brilliant time," Davies told BBC News. "If you were in the Royal Albert Hall, you would have had a unique Doctor Who experience," he said of the special scene's airing. "It's fantastic because people queued in the heat and came a long way - I met someone who came here from Belgium." Davies paid tribute to the man who will succeed him at the helm of Doctor Who, Steven Moffat, calling him "a genius". "People don't care about me, I'll just be a bit of history and the show will continue like it has done for 45 years," he added. 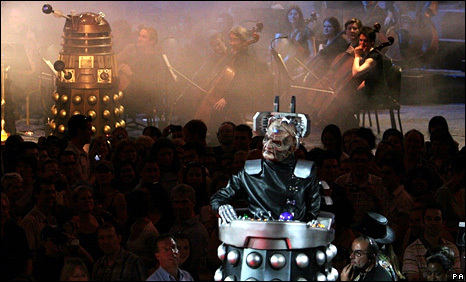 This was the first appearance of Doctor Who at the BBC Proms, although a concert dedicated to the series was held at Cardiff's Millennium Centre in 2006 to raise money for Children In Need.